The work of the Gougeon brothers has been like a guiding light to me starting when I was a young teenager. It wasn’t just the methods and skills they developed that inspired me (and led to my career in boatbuilding), it was the “outside the box” thinking about boat design they employed. 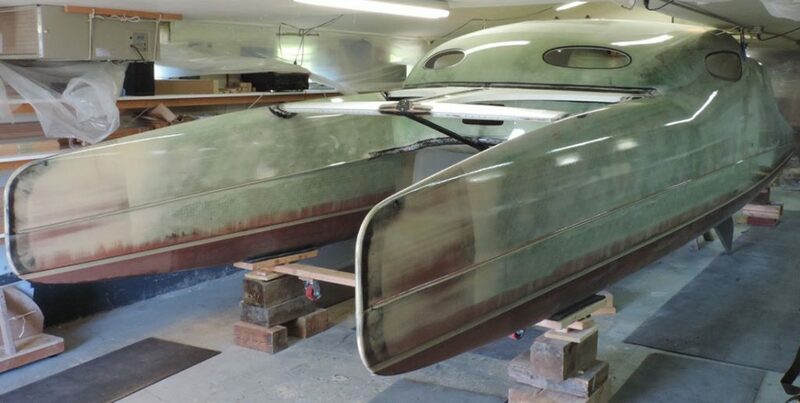 While Meade Gougeon led the effort to develop and teach epoxy skills and building methods, it was his brother Jan who had the courage to design, build, develop, and race boats that were very unusual and often counter-intuitive, yet very successful. 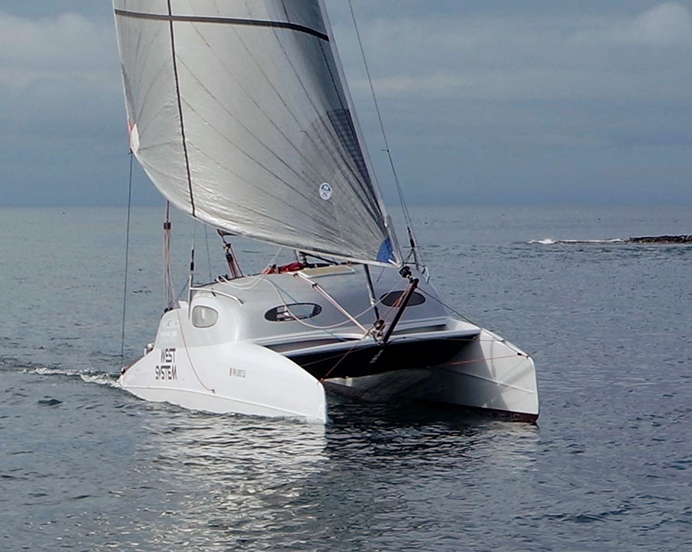 Jan’s G-32 catamaran is an example of his genius. How do I know about this boat? I own one. After being intrigued with the G-32 for 20 some years, I bought one. I overhauled and built a new rig for the boat and then raced it in the 2017 Race to Alaska. 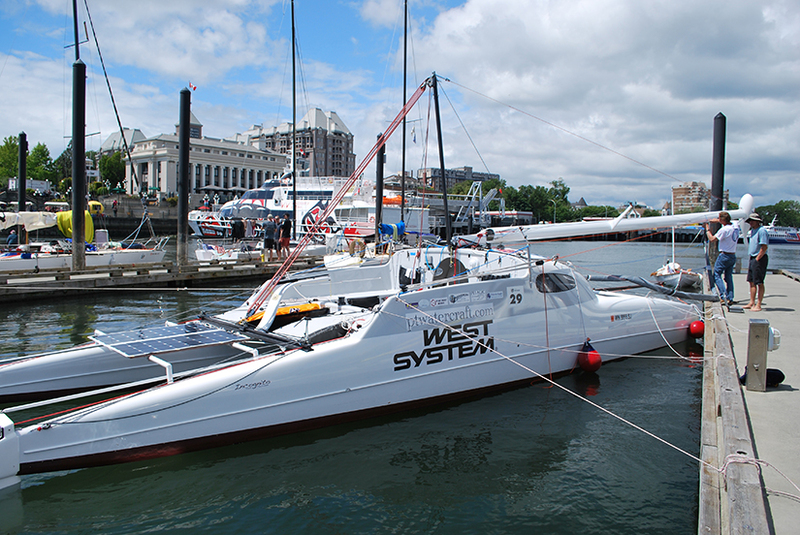 The R2AK is a 750-mile race from Port Townsend, WA to Ketchikan, Alaska. The race was somewhat trying for me because I had spent so little time sailing the boat before the start and had some issues with the new rig, but I still managed to keep the boat on its feet and knock almost 4 days off of the single-handed record. I have had a lot more experience on the boat since the race (including sailing the boat back from Alaska with my wife, Ashlyn). I have grown to have much respect and affection for it. 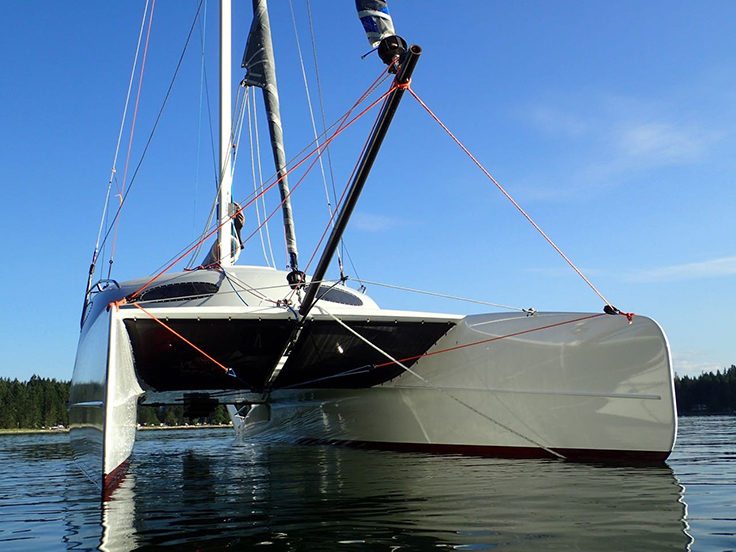 What is so different about the G-32 catamaran? It is a road legal (8 1/2′ wide), 32′ long trailerable catamaran. It’s the same width as a Hobie 16, yet twice as long. It trades initial stability for efficiency. The boat is very aerodynamic and has incredibly slender hulls, so the tiny rig pushes the boat at competitive speeds. Looking down the hulls of Russell Brown’s G-32 catamaran. The boat is tippy, yes, but it has a very effective water ballast system which is filled and emptied with control lines on each side of the cockpit. Around-the-boom reefing for the mainsail and a furling jib make controlling power very easy and the boat is quite capable in wild weather. The G-32 is self-righting. 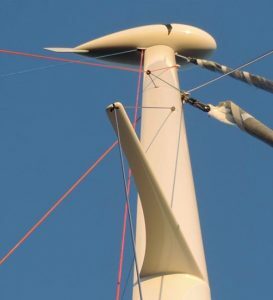 If capsized, a masthead float that doubles as a wind vane keeps the boat from going upside-down, and the boat is righted by canting the rig with the running backstays. There is some rigging and work involved, but it takes less than five minutes to right and only one’s ankles get wet. The masthead float was redesigned to be a bit smaller and more aerodynamic than the stock G-32 float. 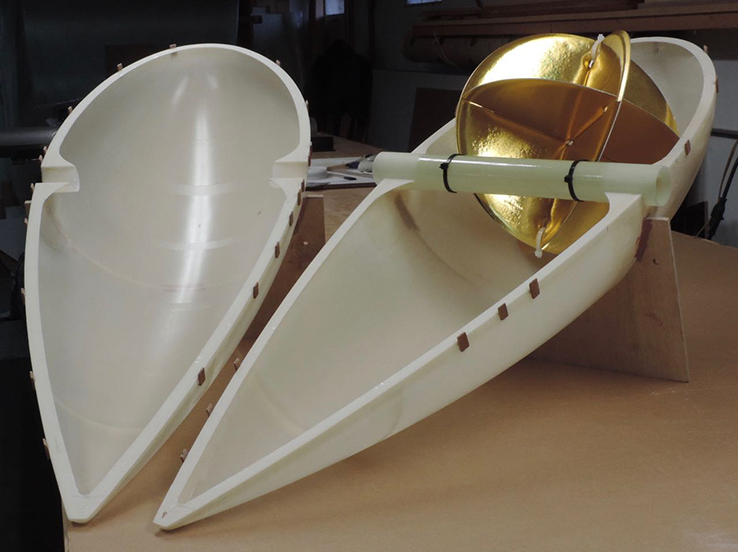 The float was built with S-glass and epoxy because a large radar reflector would be mounted inside. The fiberglass is transparent to radar as opposed to carbon fiber. In total, the new masthead float weighed 4.5 lbs. which is approximately 2.5 lbs. less than the original. The launching, retrieval, set-up, and break-down of this boat are in a class to themselves. The mast raises and lowers in literally just a few minutes using the boom as a jin pole. The entire set-up and launching can take as little as 15 minutes and a 12-year-old could do the work involved. The feature of this boat that I marvel at the most: It is dry. There are conditions when a lick of spray may come aboard, but usually, only a few droplets ever make it into the cockpit. The dryness is obviously not due to freeboard or flare, so I attribute it to extremely fine entries and a designer who had the courage to try something really different. Gougeon Brothers, Inc. produced 14 of these innovative boats in the 1990’s. They were molded in foam, fiberglass, and a predecessor of Gougeon’s PRO-SET Epoxy, a very popular laminating epoxy currently used in building all types of composite structures. The G-32 was meant to be an affordable cruising and racing boat, but it didn’t achieve large market success in the short time that it was produced. The boat had strong fans, myself included, and the sailing performance of the boat is remarkable. I think the main reason the boat wasn’t more successful was that the boat wasn’t well understood. The boom is used as a jin pole to raise and lower the mast. Re-building my G-32 showed me time and time again that every feature of this boat was done with purpose. Many of the features were integrated with one another so there weren’t many things that could be changed without affecting something else. I did a fairly major overhaul of my boat. Some of what I did was related to it being an older production boat and some was related to wanting to strengthen and outfit the boat for the type of sailing I like to do. Much of the work is documented at Gougeon32.blogspot.com. I built a new rig for the boat, which added a bit more power (the new rig is taller, but still shorter than the boat is long), and the new mast is a bit lighter and more aerodynamic. It’s also stiffer which allows flying light air sails from the masthead without excessive mast bend. Some complexity was added with the addition of the new rig, some was taken away as well (such as the masthead running backstays and forward diamond stay). Is the boat faster with the new rig? I don’t know. I do know that the boat can take a terrible thrashing and come out smiling. Crossing the straights of Juan de Fuca recently while returning from a race, I had to sail upwind in gale conditions. With the jib rolled in and the mainsail heavily reefed (which can be done in less than a minute) the boat becomes quite controllable and stable. It will tack easily, point very high, make respectable speed, and stay very dry. The boat will heave-to by merely easing the main sheet. The jib can be rolled out in seconds to increase power in the lulls. To say that this was an easy crossing would be stretching the truth, but I made it across with daylight to spare and no damage. Re-building my boat (sail number 10) was fun and I have learned a huge amount from the process. Building parts has been the most fun and I’m hoping to document some of these parts in future articles of Epoxyworks. New rudders were built in two halves in CNC machined female molds. They were constructed using many layers of carbon fiber for the skins and a foam core with a large wooden shear web in the fattest part of the foil. They are a bit more modern (higher aspect) than the stock rudders and just over half the weight of the originals. The G-32 gelcoat has been chipped off, the low areas filled and then faired with long boards. The whole boat was coated with 105/207. 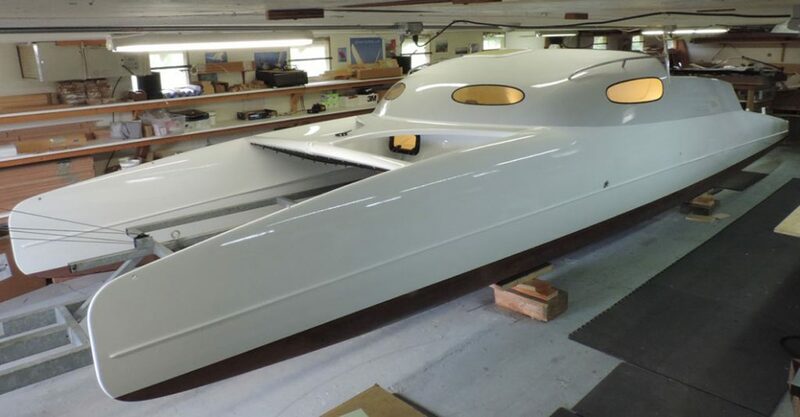 The G-32 catamaran was lightly sanded before being painted. Featured image (top)—Russell Brown’s G-32 catamaran, G-Wiz!, fully refurbished and underway. 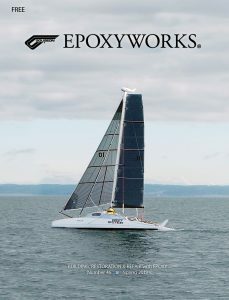 This entry was posted in Boat Mods, Multihull Construction and tagged #46, Catamaran, cover story, Epoxyworks #46, G-32, G-Wiz, PT Watercraft, Russell Brown on April 25, 2018 by ewadmin.